Greg spent $7,271,672 to win 220,142 votes. Steve spent $3,014,517 to win 232,316 votes. I spent $1,085 to win 15,649 votes. In another important area, I landed in the company of the largest group this election. As you can see in the chart to the left, far more adults in Montana did not vote for either the Republican or the Democrat candidate for governor. 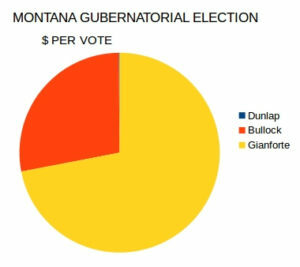 Of the 902,797 Montanans 18 and over, 450,339 did not vote for Greg or Steve. See how popular that option was. In round numbers, that is 50% for someone other than those two guys. Mid-day on the day after, I am still working with incomplete numbers. There will be some more trickle in, but none of the points will change with the additional details. 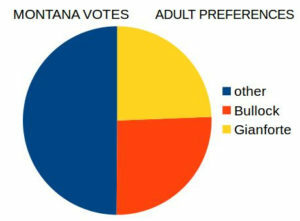 It is always useful, I think, to remember that the ruler was selected by 26% of the adults in Montana. That is not a mandate to run roughshod over the rest; the majority. That is why this country was designed as a REPUBLIC rather than a democracy. a little humility, openness and honor would be appreciated, Steve. To lay with one hand the power of government on the property of the citizen, and with the other to bestow it on favored individuals… is none the less robbery because it is… called taxation.